I went online on my Macbook today and noticed my iTunes complaining that it couldn't connect to Apple, I tried logging out and in of my account but weirdly it said it couldn't log in; I didn't think much of it at first as I thought maybe it was iTunes just being more buggy than usual. 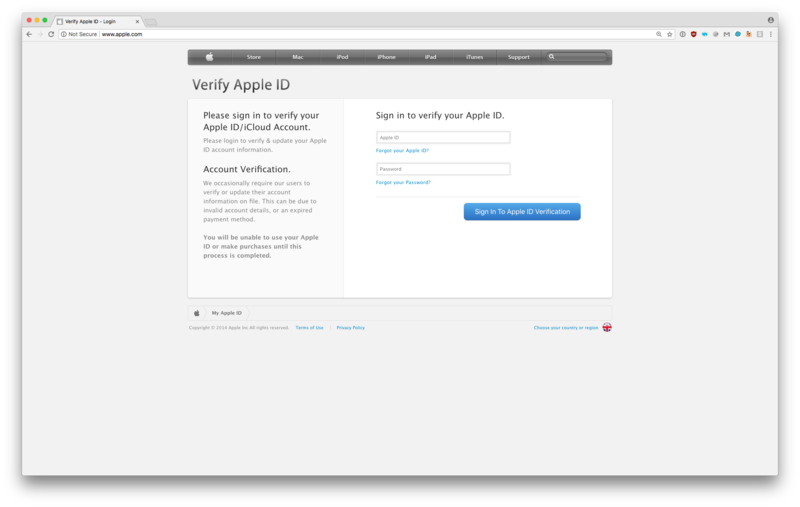 Being (somewhat of) a web designer/developer I pay attention to the little details on a website and I knew instantly this was not what the Apple homepage looks like, and they certainly didn't prompt you to login on their homepage. I dug in a little deeper to the source code for the page and could see that the source code was way too simplified for a large corporation; the only piece of JS was to verify that the email address was in the right format. I began to suspect maybe my Mac machine had been infected, so I switched to my iPhone (on the same WiFi network), tried www.apple.com, and got shown the exact same page. To me this sounded like something to do with DNS as the chances that both my devices were infected were very unlikely. I then turned to my router to have a look at its settings. Lo and behold, when digging into the DNS settings I could see that the settings looked a little odd. I had initially set my DNS settings to use Google's servers, although this was set many years ago I knew the were something along the lines of 8.8.*.*. I knew straight away that the DNS had been changed, the primary address should have been 8.8.4.4. No one has access to my router administration page aside from me on the network, and I have disabled access to the router outside of the local network I can see outside access was enabled, on initial setup this was definitely switched off. My question is: "How could the DNS have been changed/What can I do to prevent this from happening again? I try to keep my router firmware up to date (although I was maybe 1 release behind at the time of this post). Before I changed the Primary DNS setting back and I wanted to find out more about this phishing site, so I ran ping apple.com to find the IP address was 185.82.200.152. When I entered this into a browser I could see that the person had created a number of sites to try and capture logins. I suspect they're based in the US; I don't believe Walmart operates outside of the states (at least not in the UK). I have reported the IP to the Dubai based web host and am waiting for a response. I did not have the default passwords set. Host has suspended the account. Yes, your router's primary DNS entry was pointed to a rogue DNS server to make devices in your network resolve apple.com and other domains to phishing sites instead. The router possibly got compromised through an unpatched vulnerability in its firmware. I have an Asus AC87U, FW Version 3.0.0.4.380.7743 (1 release behind). Your release is over half a year old. The latest release 3.0.0.4.382.50010 (2018-01-25) comes with lots of security fixes, including RCE vulnerabilities which may have been exploited here. Fixed XSS vulnerability. Thanks for Joaquim's contribution. Fixed Smart Sync Stored XSS vulnerabilities. Thanks fo Guy Arazi's contribution. -Fixed CVE-2018-5721 Stack-based buffer overflow. Although Asus doesn't publish bug details, attackers may have independently discovered some of the vulnerabilities patched in that release. Diffing firmware releases to reverse-engineer what parts were patched is usually quite straightforward, even without access to the original source. (This is routinely done with Microsoft security updates.) Such "1-day exploits" are comparatively cheap to develop. My ASUS home router was apparently hacked and a rogue DNS server in Dubai added to the configuration. 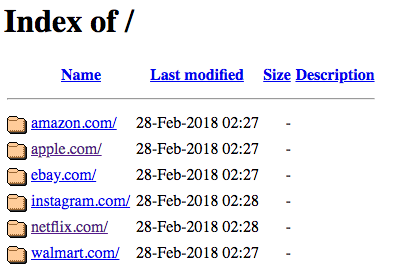 It redirected sites like http://apple.com to a phishing site that (I think) I caught before my children gave away their credentials. Check your routers kids. The fact that you got certificate warnings makes it less likely that an attacker managed to get into your machine. Otherwise, they could have messed with your local certificate store or browser internals and wouldn't need to conduct a blatant DNS change. Even if your router interface isn't visible from outside your network, it can be vulnerable to a range of attacks. As an example, take this Netgear router arbitrary code execution exploit from a while ago which had Netgear routers execute arbitrary commands sent as part of the URL. The idea here is to trick you into visiting a prepared website that makes you conduct the attack yourself by issuing a specially crafted cross-origin request to the router interface. This could happen without you noticing and wouldn't require the interface to be remote accessible. Ultimately, the given information doesn't reveal the exact attack path. But it's plausible that they leveraged vulnerabilities in your outdated firmware release. As an end user you should at least update your firmware as soon as possible, do factory resets if necessary, and keep your router interface password-protected even if it's only accessible from the intranet. It's obvious that someone changed DNS entries inside your router, probably using default credentials. You should go with factory reset, update your firmware, change default credentials and disable outside access to it. One thing I would HIGHLY suggest in this case is trying to flash your router with something like DD-WRT (open source firmware). The DD-WRT forums list a beta build for your router. These builds are often far less susceptible to outside invasion like this, because they're built with best practices. Contrast with this long list of vulnerable ASUS routers (which list the problem you described). 40 models of the Asus RT line of home routers are affected by five vulnerabilities that allow an attacker to get ahold of the router password, change router settings without authentication, execute code, and exfiltrate router data. Another suggestion is to buy a router that can better patch itself. I bought an Amplifi a while back, and its touch screen notifies me when I have a firmware update (two taps and I'm patched). Not the answer you're looking for? Browse other questions tagged dns router or ask your own question. Could my DNS requests get manipulated while using tor?